What is Hope? The Hebrew word means: expectancy, something I long for, to wait for, to be patient for. The Greek word means: to anticipate with pleasure, expectation. Hope is our belief and anticipation for what we look forward to, but haven’t yet realized. Hope is when you anticipate or expect by faith. Someone said: Hope is “a strong and confident expectation.” That is because a Christian’s hope is not based in wishful thinking, or horoscope happiness but is based in faith in God. Christian hope is tied to faith in God. A Christian’s definition of hope is far superior to that of the world. Instead of wishing or hoping for something to happen, a believer knows that their hope is certain; it is solid, concrete evidence because it is grounded in the Word of God and we know that God cannot lie. What does Hebrews 11:1 say? Hebrews 11:1 Now faith is the substance of things hoped for, the evidence of things not seen. We hope for things not seen, faith in God’s word is the substance, the tangible evidence for our hope. We don’t hope there is a God like others hope there are aliens. We hope with faith in God’s Word. Our hopes are based in God and his promise. The world hopes in rainbows, and fortune cookies, and lotteries, and falling stars, and etc…We hope in God. Psalm 42:5 Why art thou cast down, O my soul? and why art thou disquieted in me? hope thou in God: Psalm 38:15 For in thee, O LORD, do I hope: thou wilt hear, O Lord my God. So, the Christian’s hope for the future and hope of good things to come, is not silly schoolgirl wishes, it’s not pie in the sky theology, it’s not foolish minded people, it’s not hail-Marry passes. 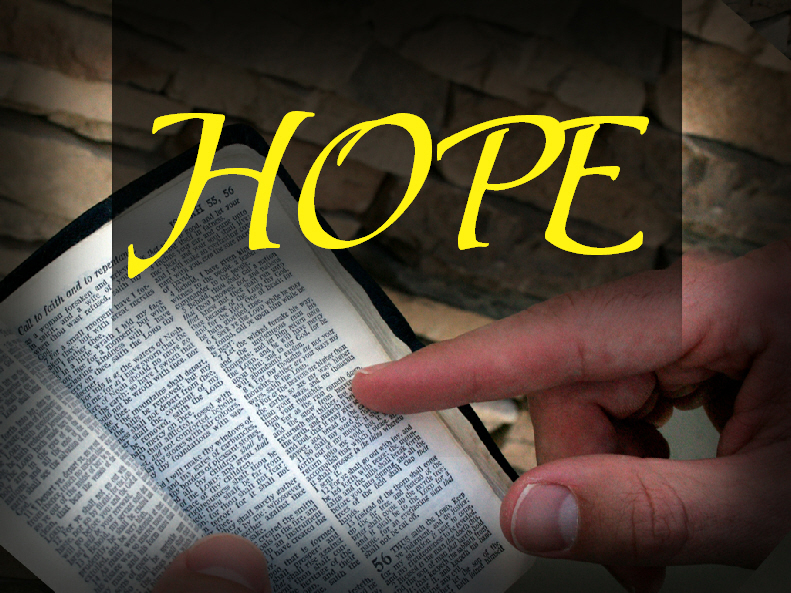 The Christian’s hope is expectation based in faith in God and His Word. Romans 5:2-5 is a good outline to learn about our hope as a Christian. Because of what God promises us, we have so many reasons to rejoice in hope. Praise the Lord for hope found in Christ. I can’t give you much hope for the world’s future, or America’s future, but I can give you many reasons to rejoice in a Christian’s hope for our future. What I mean is that having a Christian’s hope gives us many advantages and blessings and gives reasons to praise God for his goodness. The reason being we have three resources that will build us up during those times of tribulation. 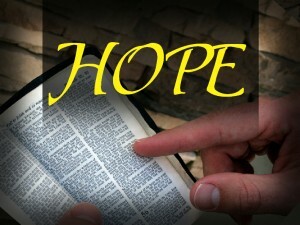 Psalm 119:49 Remember the word unto thy servant, upon which thou hast caused me to hope. I will never have egg on my face, never have to admit that I was wrong when my hope is in God. Have you ever hoped your team would win and they lost. That will never happen to those who hope in God. We will never be ashamed, never have to hang our heads, and will never lose in the end. All the things that we hope for as a Christian – not one will fail, not one will be lost, not one will fall by the way side. Our hope is certain because it’s based in faith in God. No politician, no business man, no athlete, no philanthropist, no educator, no scientist, nor doctor is my hope. My hope is not in man, my hope is in one person – Jesus Christ. And I will never be ashamed in Him. On Christ the solid rock I stand all ground is sinking sand, all other ground is sinking sand.